Takeaway: While accidents are more severe, all incidents should also be tracked and measured in order to reduce costs to the organizations and prevent more serious health and safety events. How does your company manage its safety and health incident information? Traditional safety methodology involves capturing and analyzing data related to accidents and incidents. This provides important insight into the safety of the workplace, but it is only part of the picture. Unfortunately, it just so happens to be the part of the picture that we are most often judged on. Bidding work and obtaining contracts often requires providing detailed safety information. This information tends to center around failure rates related to personal injury. Some companies, for example, require prospective contractors or suppliers to be members of organizations that you report to and supply with your system and documentation, including policy and procedure, statistical results of your safety performance, and often your workers' compensation data (learn about Managing Contractors from Start to Finish: The 4 Stages of Contractor Management). Your safety data is important and it will be evaluated by companies who wish to work with you. That means you and your organization must have a comprehensive understanding of that data and how to manage it. And that understanding starts with knowing the difference between incidents and accidents. Accidents can be defined as any unplanned, unforeseen, or unexpected event that has a negative effect on the activities of an individual or organization. It can result in injury, infection, disease, or death, as well as loss of property or damage to the environment. In addition to the personal suffering they can bring about, accidents also have business consequences in the form of compensation costs, loss of productivity, decreased employee morale, and in some cases fines, citations, and damage to the company's reputation (find out How to Look After Your Business' Safety Reputation). While that definition makes accidents seem quite broad, they're a narrow category when compared with incidents. That's because accidents are really a subset of incidents (although the two terms are often used interchangeably). Both incidents and accidents are unplanned, unforeseen, and unexpected events. The difference is that accidents result in losses while incidents don't result in serious damage or harm. Incidents even include near misses, which are events that could have resulted in a serious accident but in which the adverse consequences have been avoided. Complicating matters is the fact that textbooks and legislation also uses the term "sentinel incident." This term is used to denote events that, due to their severity, are not deemed reportable. OSHA also uses the term for events that result in hospitalization and amputation resulting in inspections that reveal previous undocumented injuries. Incidents don't always have serious effects, but most companies still respond to these events, either by recording them in order to analyze and track safety metrics or by taking proactive steps such as holding a brief safety meeting to address the event or conducting a review of the effects that led to the incident. This practice makes perfect sense from a health and safety standpoint. Tracking all incidents and their potential or actual costs is a critical aspect of managing your performance data. This information highlights where you should focus your efforts to prevent these incidents from recurring (sometimes with worse consequences). Companies can then manage the identified risks by taking the appropriate administrative control decisions (treat, tolerate, transfer, terminate). Depending on your jurisdiction, you may be required to track, analyze, and report on the incidents in your workplace. The language of the laws clearly define what you must report and whether an investigation (internal, external, or both) is required. Near misses and other less serious incidents might not seem like important events to track, but they have a surprisingly big impact. To understand why non-accident incidents matter, considered two models that represent their broader implications. First, let's have a look at the iceberg model below. 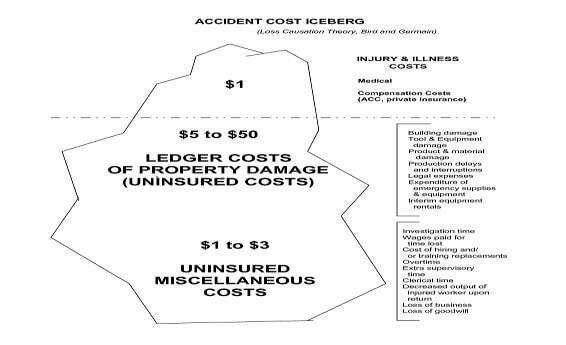 What this model shows is that small incidents carry heavy "hidden" costs. For every dollar spent dealing with an injury or illness, there is anywhere from six to 53 dollars spent in related expenses. 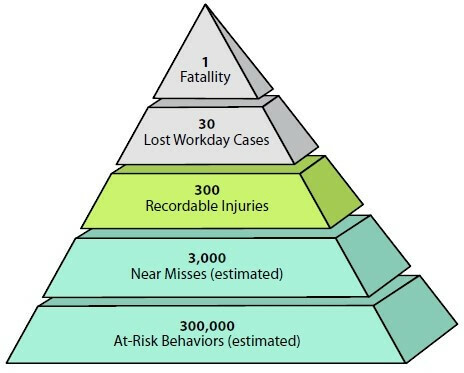 Now consider this pyramid, which provides a graphic representation of how incidents and accidents relate to each other in terms of both frequency and severity. The relationship depicted in the pyramid reveals that severe accidents and injuries are often the culmination of several less serious incidents. By taking steps to reduce the number of risky behaviors and near misses, we are also preventing serious injuries. 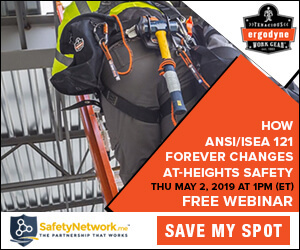 Conversely, employers or safety professionals who dismiss or don't pay attention to near misses can expect the rate of recordable injuries, lost work days, and fatalities to increase. Tracking these incidents comes at a cost, if only in the form of an administration fee for managing all the data. But when we look at the additional costs and the serious accidents that are associated with minor incidents, it's clearly worth the investment. But does this apply to the estimated 300,000 at-risk behaviors that form the base of the pyramid? Yes, to the best of your ability and budget, you need to keep track of these. Your safety management system (SMS) should have some type of formal behavior observation process. I've made the case for tracking not only accidents but also the incidents that don't directly result in serious injury or damage to property. Now, we need to discuss what you should do with the data once you've captured it. Reporting only on accidents and their costs provides your senior management team only a partial picture of where your workplace stands when it comes to worker safety. Your reports should include the full picture, including all incidents, and make the case for taking these events seriously. Taking near misses seriously means, at the very least, investigating and recording them. Failing to investigate high potential incidents and accidents can result in catastrophic failure and represents a significant risk to the company. So, make sure you're presenting management with the full picture: the failures, the positives, and the data you've gathered and analyzed. Otherwise, they may not have the information they need to make the most appropriate decisions or take the right actions. Good decisions have an impact on the bottom line, both in terms of worker safety and company profitability. Using software improves the statistical validity of the safety data you're capturing and managing, which allows you to make better, more informed decisions. It doesn't matter how you label or define accidents and incidents. It doesn't matter whether you call certain events near misses or risky behaviors. What matters is that you record them, investigate them, analyze them, and report them to legislators as required. You need to take preventative action based on the types of incidents that lead serious events, not wait for those serious events to take place. Whether you're dealing with an accident or incident, it's your job to use all the information you have at your disposal.